Steroids are a class of drugs that are used to treat immunological, inflammatory and allergic diseases. Also called corticosteroids or glucocorticoids, these are different from anabolic steroids used to enhance maleness and muscle power. Corticosteroids are widely used to treat asthma, allergies, arthritis, skin disorders caused by immunological problems, multiple sclerosis, stress related disorders and even cancer. They reduce inflammation and affect the functioning of mismanaged immune system. Corticosteroids are similar to cortisol, a hormone that our body naturally makes in the adrenal glands. During stress, the body makes enough amounts of cortisol to keep away the diseases or stress induced physiological ailments such as inflammations, allergies and other serious chronic disorders. 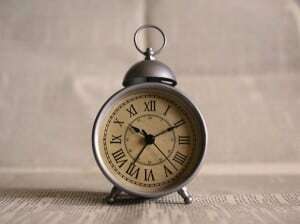 Normally, small amounts of cortisol are regularly (majorly in the morning) produced by the adrenal glands and released in the blood stream. In case of stress induced, inflammatory disorders, allergic diseases and other ailments, corticosteroidal medicines help supplement extra cortisol in the body to reduce the symptoms. How do steroids act in your body? Steroids, upon entering the body, bind to steroid receptors in the cell. Steroid receptors are proteins that specifically bind to steroids. They then move into the nucleus, a portion of the cell where genetic material is stored and there they control the activity of the genes. Steroids then activate genes that produce anti-inflammatory agents and suppress genes that promote inflammation. They favor the production of anti-inflammatory protein lipocortin which inhibits the activity of enzyme phospholipase A2. This enzyme favors the production of arachidonic acid, which is a precursor of pro-inflammatory agents. Steroids also regulate the activity of nuclear factor-kappa B which controls genes and enzymes involved in inflammation. Steroids help in treating various disorders by demonstrating their anti-inflammatory and immunosuppressive properties. Steroid medications are given in a variety of forms such as oral, intravenous, injections, nasal sprays or inhalers. If they are to be given in large amounts in case of sudden injury or onset of a symptom, intravenous or injections are preferred. After that, to decrease the dose, oral steroidal drugs are given. Turmeric is an ancient herb that has long been used in food and as medicine. It is added in curry and other food items for color and aroma. For therapeutic purposes, turmeric is used to treat swelling, cold, cough, eye problems, skin disorders, pain, inflammation, arthritis, and cancer. An active ingredient in turmeric, curcumin, is responsible for its characteristic color, aroma and most of the therapeutic properties. Turmeric has a lot of physiological healing effects similar to steroids. Proven by research, it treats inflammation of several types such as general and arthritic, rheumatologic or immunologic imbalance, swelling, pain, allergic reactions of the skin, eczema and many more disorders, just like steroids do. Of all the effects of turmeric, some of the most common ones that are similar to those of steroidal medications are described in detail below. Research has suggested that several phenolic compounds such as curcumin, that are present in turmeric, show the powerful anti-inflammatory and anti-oxidant effect on the body. Research performed on turmeric showed that it directly scavenges the oxidants in the arthritic and inflamed tissues. The major inflammatory pathways in the cells in diseases like cancers, arthritis, asthma, and others include the ones regulated by a signaling factor called NF-κB. NF-κB is the major target of corticosteroids to control inflammation. Another compound called cycloxygenase 2 (COX2) is an important inflammatory molecule which is controlled by steroids. Several studies on turmeric have concluded that both these factors, NF- κB and COX2 are analogously controlled by turmeric as well, thus producing the effects similar to those of steroids. Another potent anti-inflammatory action of turmeric has been shown to be in uveitis patients. Chronic anterior uveitis is the inflammation of the uvea in the eye. It is caused by the immunological imbalance and infections often leading to permanent damage to the eye. Currently, only corticosteroids are available as a treatment regimen for uveitis. Research on turmeric has shown that curcumin produces healing anti-inflammatory effects on uveitis affected eye, similar to that of corticosteroids . Yet another comparative study on the use of turmeric and corticosteroids for the treatment of inflammatory bowel disease (IBD) revealed that besides being equally effective in managing the inflammation in IBD, turmeric may also be treated as a less expensive treatment option for this disease as compared to steroids . 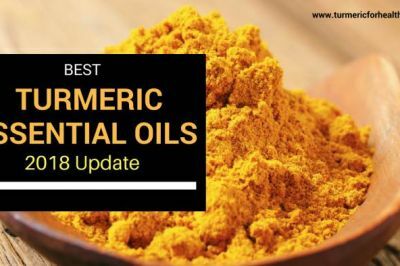 What it means: Turmeric shows anti-inflammatory effects similar to those of steroids in treating inflammatory disorders like asthma, cancer, uveitis and arthritis. It leads to the pharmacological effects analogous to those caused by administration of corticosteroids and provides an option of more non-toxic, effective and cheaper medication. Just like steroids, turmeric controls pain and burning sensation caused in many disorders, injuries and cancer. A comparative study on the effects of steroids and turmeric on oral fibrosis (a precancerous disease involving stiffening of tissue) showed that turmeric was in fact far more superior and efficient in pain management than steroids. Submucosal oral fibrosis causes a lot of painful symptoms and marks the onset of oral cancer. Normally, steroids are given to manage these symptoms. 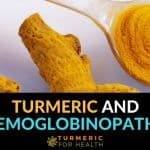 However, it has been found that while acting similar to that of steroids, turmeric produces better therapeutic results . Another research on turmeric and steroids a very common disease of the oral cavity provided similar results. Recurrent aphthous stomatitis is a disease of the mucosal layer of the mouth in which painful ulcerative lesions are formed very frequently. These lesions are self-contained and disappear quickly after a few days or even hours but are very painful and discomforting. To manage this disorder, the major line of treatment currently used is steroids that not only control the pain but also the frequency of recurrence of the lesions. 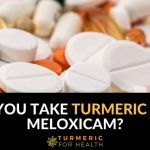 In this study, it was found that curcumin, the active ingredient of turmeric also produced the same results of pain management and controlling of the level of occurrence of the ailment. In fact, the analgesic effects of curcumin were assessed to be better than that of steroids. What it means: Turmeric helps in reducing burning sensations, pain and discomfort caused due to various disorders. Its target functions are comparable to that of steroids and its final healing effects are similar and even better than that of the latter one. Apart from healing several symptoms, both steroids and turmeric share the property of showing protective effects on the body. 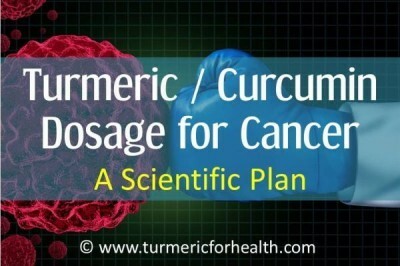 Curcumin has immunomodulatory activity- it can alter immune responses. At low doses, curcumin boosts immunity, improves antibody functions and helps fight infections. However, at high doses, it reduces the production of inflammatory chemical like TNF-alpha, Interleukins and manipulates genes involved in inflammation. Several diseases have a tendency to recur with adverse conditions such as stress or changing the environment. Steroidal drugs are given in such case to prevent the occurrence or recurrence of such symptoms. One such study on pulmonary fibrosis revealed that with lung damage due to smoking and other factors, the risk for occurrence of fibrosis and cancer is increased several fold and steroids show a protective effect on the lungs, preventing the onset of the disorder. 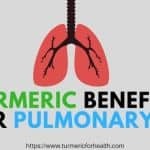 Turmeric has also been found to exert similar protective effects on the lungs and other parts of the body by virtue of its healing antioxidant and anti-inflammatory effects. Thus it can be compared in function to steroids. What it means: turmeric, just like steroids, shows protective effects on tissues and prevents the onset of chronic diseases. Studies prove that curcumin can influence the body’s ability to secrete natural steroid, cortisol. This steroid is produced by adrenal glands. One study proves that at low doses (1-20 µM) curcumin inhibits secretion of cortisol. However, at high doses (50 µM) It stimulates cortisol secretion. The fact that curcumin can control steroid secretion in our body, suggests that it can be developed as a drug to treat Cushing’s or Addison’s disease or any disease occurring as a result of inappropriate cortisol secretion. In addition to cortisol secretion, it is said that curcumin may regulate the release of steroid hormones like aldosterone, testosterone, and estrogen, as well as peptide hormones and neurotransmitters. What it means? Unlike synthetic steroid drugs, curcumin can control secretion of natural steroids produced in the body. Following studies demonstrate the various cases in which turmeric’ bioactive constituent have shown similar or superior action than steroids. Chronic anterior uveitis is inflammation of the eye. A study was conducted wherein patients received curcumin or curcumin and antitubercular medication for 12 weeks to treat this condition. Both the groups showed significant improvement and recurrence of the disease was low. 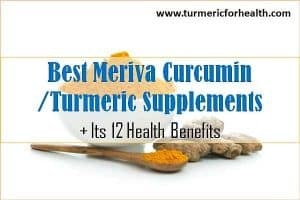 Researchers concluded that curcumin’s therapeutic effect was comparable to that of steroids which is the only treatment available for this disorder. The advantage of choosing curcumin over steroids was the lack of side effects. Lung transplantation injury is damage of the lung tissue which occurs when the blood returns into the organ after a period of lack of oxygen. Steroid dexamethasone is commonly administered to prevent such injury. Experimental studies prove that like dexamethasone, even curcumin can prevent such injury by reducing oxidative stress (imbalance between prooxidant and antioxidant agents in the body). It also curbs inflammation by inhibiting the activity of nuclear factor kappa B, a protein that regulates the activity of genes involved in inflammation. Both these mechanisms make curcumin a potential alternative therapy to protect against lung transplantation induced injury. In the animal model of arthritis, curcumin was evaluated for its efficacy on early stages of arthritis. Animals were given either curcumin (100mg/kg) or prednisone (1mg/kg or 8mg/kg). Curcumin was found to be more effective than prednisone in controlling inflammation for the first six hours since the development of arthritis. Researchers concluded that turmeric can be therapeutic in the early stages of arthritis. Mouth ulcers are a common and recurrent problem in many individuals. Since it has a high frequency of occurrence, researchers are looking for a foolproof remedy to treat ulcers. In this study patients were given either curcumin gel or steroid gel and were asked to apply it thrice a day on each ulcer. Within 7 days a significant reduction in pain, size, and number of ulcers was observed in both groups. Researchers came to a conclusion that curcumin’s antioxidant, anti-inflammatory and analgesic properties make it a viable alternative to steroids for treatment of oral ulcers. Spinal cord injury may sometimes require a high dose of steroids to treat it. However, a high dose of steroids can cause side effects and toxicity. Looking for safer alternatives, scientists recommend the use of natural compounds like curcumin and quercetin (a natural antioxidant found in fruits and grains). Both of these compounds can exert antioxidant, anti-inflammatory and neuroprotective properties which is why they could be useful in treating spinal cord injury. Additionally, scientists hypothesize that using a combination of curcumin and quercetin can aid in treating spinal cord injury without causing any side effects. Inflammatory bowel disease is characterized by inflammation of large and small intestines. It is treated with steroids and antibiotics but long term use of these agents can cause side effects. Curcumin inhibits oxidative stress, manipulates a number of biochemical pathways to control inflammation and even suppresses inappropriate immune responses. Clinical trials prove that curcumin, when administered along with standard drugs, improves treatment response. This indicates that curcumin can be developed as an alternative to steroids in treating IBD. If functions and effects are t be emphasized, turmeric indeed is equally or in some cases more effective than steroids. It causes similar pharmacological effects on the tissues and heals the symptoms with maximum efficiency. However, turmeric is far more superior to steroids because of its low toxicity and low costs. Steroidal, drugs have a high rate of occurrence of side effects some of those being non-reversible. These drugs are also not cost effective. Turmeric, on the other hand, is inexpensive and non-toxic treatment for several chronic disorders. It can invariably be considered as a future wonder medication and a replacement to several toxic steroidal drugs. Steroids cause a number of major side effects in contrast to turmeric: the side effects caused by steroids differ on the basis of the type of steroid consumption. For instance, the side effects and their intensity by taking oral steroids are different from those of intravenous steroids. Side effects caused by over-consumption of turmeric: turmeric has not been reported to cause side effects if consumed in low to moderate amounts. However, even if taken excessively, it does not pose such serious side effects as those of steroids. As mentioned above, unlike steroids, turmeric does not cause any severe side effects. In fact, it can actually help with the side effects caused by steroids. What it means: after analyzing the number of side effects caused by both steroids and turmeric, it can very well be concluded that turmeric is a lot safer medication as compared to steroids. Apart from producing similar or even better healing effects than steroidal medications, it can also be used to take care of side effects caused by steroids. It is best to include turmeric in your diet. You can have it with yogurt or add it to your curries, rice preparations, and soups. 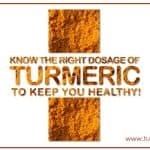 Turmeric supplements are also available in the form of capsules containing powder, tinctures and fluid extract. But you should only take supplements when there is no way to take the powder. 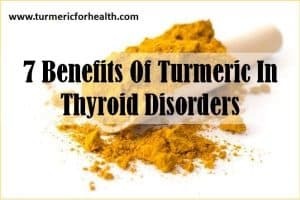 You can easily take around 4-5 gms of turmeric powder a day. But always start small if you are new to taking turmeric. Turmeric as a part of the diet does not cause any side effects. However, turmeric supplements contain a number of components other than curcumin to enhance its effect and this might not suit everyone. Therefore before starting supplements, consult a doctor about the dose and safety of the supplement. Avoid turmeric supplements in case of pregnancy and lactation and prior to surgical procedures. Also, avoid taking them if you are suffering from diabetes and taking medications to lower blood sugar. Individuals suffering gallstones, blockage of bile passages and gastrointestinal problems should exercise caution while taking turmeric supplements. Steroids are a very important class of medications used to treat several common and complex indications that deal with immunological disturbances, inflammation, and pain. 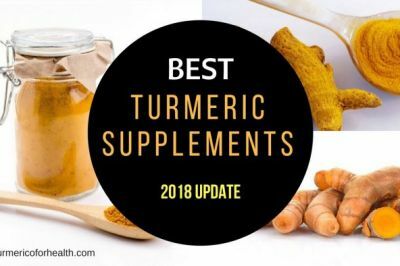 Turmeric, though long been used traditionally in-home medication, is emerging as a powerful competitor to major drug families for the treatment of many diseases like arthritis, inflammation, pain, swelling, cancer, etc. 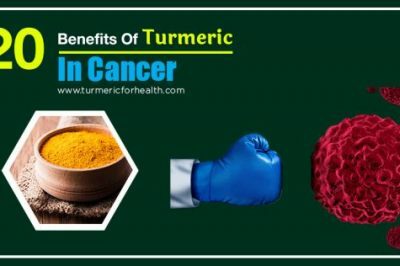 When compared to steroids, the effect of turmeric is highly comparable to the former class of drugs and thus the therapy area is also similar. In fact, turmeric has been proven to be better than steroidal medications in several studies for the treatment of rheumatological and inflammatory disorders. 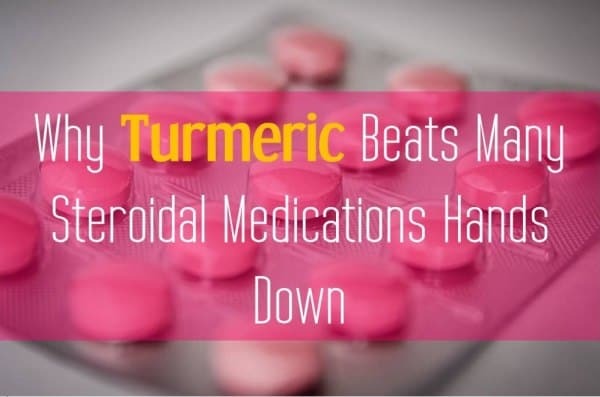 Not just the effects, turmeric also poses lesser side effects as compared to steroids and is a lot cheaper in terms of costs than its synthetic counterpart. It can thus be considered as a potential future game changer and a tough competition to steroidal drugs for the treatment of several disorders. 1. Is turmeric supplements good for children under 3 years? 2. 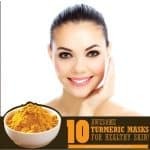 How’s turmeric use to treat rashes on the skin? For skin rashes, you can make a paste of turmeric and olive/coconut oil and apply it to the affected region. Let it stay for 20 minutes and then wash with cool water. This can be repeated 2-3 times a day. Please conduct a patch test first. Turmeric can cause yellow stains so please be careful about that. Your information is truly doubt clearing and gives a ray of hope to the most hopeless and stressed people. Keep the good work going and if possible send a small sample quantity of the genuine turmeric to your viewers / patients , which one should use in need. Hi. Thank you for the appreciation. 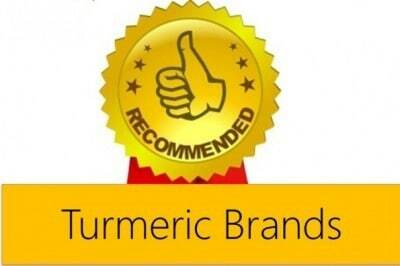 We promise to keep you updated with latest research on turmeric. My wife has knee arthritis. She had severe pain but started using 2 Meriva curcumin capsules daily. Unbelievable, but the pain left her right from the early days. Now she feels very good, but takes 2 capsules of Meriva every day. Meriva supplements are very useful for bone and cartilage pain .We recommend you warmly. Hi. Glad to hear that turmeric benefits your family. Wish you great health. 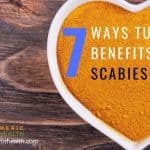 Can I use tumeric as a salve on my skin for my eczema flare up, as well as taking it internally? Hi. Yes you can use turmeric topically for eczema in addition to taking it orally. You can make a paste of turmeric powder with coconut/olive oil and apply it topically 2-3 times a day. Please conduct a patch test before using. You can take Golden Paste orally. Start with small doses such as 1/4-1/2 tsp and if you see no side effects then increase the dose gradually to 1 tsp 2-3 times a day over a few weeks. Best taken with food to avoid acid reflux. Avoid taking it at the same time when you take meds. I have had Myasthenia Gravis for 17 yrs. Have been on prednisone and imuran to keep immune system from attacking me. I now have osteoarthritis throughout body and spine is weak and damaged. I have much pain as well. 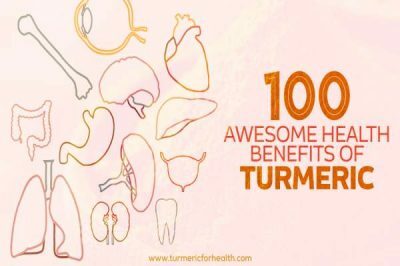 Is there any proof that tumeric can help with lowering these nasty drugs im on? Can it help this autoimmune disease? Hi. Turmeric can help in pain relief. It can also regulate immune responses and benefit in autoimmune diseases like myasthenia gravis. Your health condition may require turmeric supplements as well. Please consult a health practitioner about the same. Hi. There has not been any study to prove this, but curcumin found in turmeric can help reduce inflammation and other symptoms of asbestosis. You can give him Golden Paste. Start with small doses such as 1/4-1/2 tsp and if you see no side effects then increase the dose gradually to 1 tsp 2-3 times a day over a few weeks. Best taken with food to avoid acid reflux. Avoid taking it at the same time when taking meds. I have been on steroids at least one week out of every month over the last 6 months, treating inflammation of the skin (hive like bumps/lupus) . Once the steroid course is finished I am only having about 2-3weeks break before inflammation reoccurs. I am looking for an alternative to this with hope to keep it all at bay. I think a high dose maybe required, any advise or suggestions? Hi. Turmeric is a natural alternative to steroids and benefits in skin conditions. You can take Golden Paste. Start with small doses such as 1/4-1/2 tsp and if you see no side effects then increase the dose gradually to 1 tsp 2-3 times a day over a few weeks. Best taken with food to avoid acid reflux. Avoid taking it at the same time when you take meds. My grandfather has been diagnosed with spinal stenosis after having a lot of pain for quite some time without much relief. He’s on oral prednisone for a short time which appears to help with his pain. He’s also on high blood pressure meds and blood thinners. Is it safe for him to use turmeric? I bought supplements for myself recently for iritis that I’ve gotten a few times now and wanted to give him some to try. I bought Turmeric Curcumin with Bioperine 1500mg by Schwartz Bioresearch. Hi. Turmeric is a natural anti-inflammatory and anti-hypertensive agent so it would benefit him. However turmeric is a blood thinner so one has to be cautious while taking it if already on blood thinners. Also 1500mg may be a fairly high dose for him since he is already taking blood thinners. Turmeric may be included in his diet but it is best if you consult a herbalist and naturopath. I am suffering from TMJ my left side of my face is swollen along with the lymphoid in back of my head. I don’t like taking steroids, Would turmeric help with this? I’m Leary to try anything because I take medication for anxiety and depression. Hi. 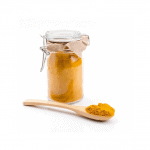 Turmeric should help attenuate the pain and inflammation in TMJ. It is also a natural antidepressant. You can take Golden Paste. Start with small doses such as 1/4-1/2 tsp and if you see no side effects then increase the dose gradually to 1 tsp 2-3 times a day over a few weeks. However turmeric is not meant to replace professional medical advice, so do consider taking a second opinion and informed decision regarding your health. Hi. Dietary turmeric is safe. Avoid giving it on an empty stomach and close to the time of giving any medications. My daughter who is 13 is having a IBD flare up. Her dr wants her to start prednisone but I want to investigate the benefits of turmeric. She is seeking to start her at 40mg a day. I read in this article that you could mix it into yogurt which she eats everyday. I would like to try this. How much do you suggest? I make a paste with coconut oil, black pepper and water…then freeze it in little blobs. Easier to take and more bio-available. Cook 1/2 cup organic Tumeric with 1 cup water until thick-about 7-8 minutes. Add 1/2 cup coconut oil and 1 1/2 teaspoons of black pepper. I have a horrible rash caused from a gluten allergy from inflammation in my gut. Could I take Tumeric instead of a steroid to make the rash go away? I’m researching countless sources regarding our dog’s Cushing’s Disease (CD). He partially tore his left ACL in 2013 which mended well using the WoundWeat ATrac brace but, as can often happen, he tore the other side ACL this past summer. Lots of pain and stress. He began showing CD symptoms one year ago and was tested – no tumor but definite symptoms. We’ve addressed with diet, Si Miao San, enzymes, more … I’ve been told that one can treat all symptoms holistically to a point but Rx medication will eventually be needed to address the cortisol issues. I put him and our 17 yo dog on GP for pain control and it’s been GREAT. From everything I’ve learned here on TFH, and has worked for dogs and me, wouldn’t the GP also be addressing the cortisol issue vs. having to go on Vetoryl? … Will be getting blood work work, etc. next week. Hopefully you or any other readers can Please provide more input. 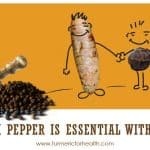 Tex, great to hear that turmeric benefits your and your pet’s health. There has been limited research on turmeric/curcumin’s utility in Cushings disease and they are affirmative. But these studies are with reference to human cells. Turmeric does normalize cortisol secretion as per the studies. Since your pet is already on GP for managing pain you could get blood reports done and observe if turmeric has made any difference to cortisol secretion. Please do share your results and conclusions with us. All your information is very encouraging, thank you. I have been on methylprednisolone (4mg) for nearly 6 months and really want to switch to natural products. I was just introduced to CuraMed (R) as it is a more concentrated version of curcumin. Reducing from 4mg of the steroid has been more than difficult. Even cutting back 1mg at a time my whole body, neck, shoulders, back, hips and knees all hurt. Can you suggest a transition? Is the combination of steroid and curcumin contraindicated? I am also concerned because all literature says not to go cold turkey off steroids. Thanks. Sue Ellen, I have the same question. My dog is on Prednisone now and I’m trying to phase him into Curcumin/Turmeric but I have no idea if it’s a bad idea to take the herb and the drug together, or its okay. Also, how do Curcumin and Prednisone compare in dosage? I have no idea how much to give my dog as I phase him into it, and can’t find good answers, or even vague ones. Anyone have a suggestion? Lisa Jean, did you find any information out on this? My dog is also on Prednisone (for IMHA). I would also like to know if we can give Turmeric at the same time as the prednisone, and then taper the prednisone off in a few months time? Hi, I did find out that it is okay to use Turmeric with Prednisone. I’m giving my dog 1/4 tsp twice per day of a paste that is made with Turmeric powder and coconut oil. You have to start in at even less in the first few days because it can cause a little GI irritation at first. But, as the Prednisone is phased out you can increase the Turmeric to as much as 3 half tsps. per day for a medium sized dog. The herb and the drug do not have a conflict. So far so good with my dog. He will be completely off the Pred in another 3 weeks. 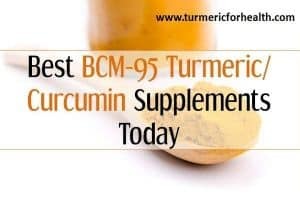 There is a Turmeric group on Facebook where you can get all kinds of info. Look up Turmeric User Group on Facebook and you’ll find it. Cheers! Hi Lisa! I am currently in the exact same situation as you are. My dog is also on Predisone now and i noticed that the drug is having a negative impact on his hind legs.I intend to start him on GP May I know how your dog now? And is yours a large dog? Like to know cos i am I sure of the initial dosage to feed him, Cheers! i Lisa! I am currently in the exact same situation as you are. My dog is also on Predisone now and i noticed that the drug is having a negative impact on his hind legs.I intend to start him on GP May I know how is your dog now? And is yours a large dog? Like to know cos i am unsure of the initial dosage to feed him, Cheers! Curcumin has similar action as prednisone when it comes to targeting inflammation. It is safe to give turmeric in diet even with this medicine. There has been no study comparing the dose of curcumin and prednisone but turmeric is more than just curcumin. It has many other compounds that have an anti-inflammatory effect. If you are giving him Golden Paste avoid giving it close to when you give him Prednisone, this is because black pepper in GP interferes in drug metabolism. Yes it is advisable to wean off steroids slowly so that body gets accustomed to low doses. You can consume turmeric in diet as Golden Paste. Start with 1/4 tsp and increase gradually to 1-2 tsp 2-3 times a day or how it suits you. Avoid taking it close to other medications. Curcumin works well with steroids. Many users have reported that its easier to go off steroids when taking turmeric. But you should consult a doctor about this. I have GCA ,Giant Cell Arteritis, and am on 30 mg. of prednisone a day, down from 60 mg. 4 months ago. Would like to begin taking Turmeric supplements as I am having trouble reducing to 25 mg. a day without experiencing symptoms. Any ideas? Hi Kathleen, insted of supplements, we would recommend you start with golden paste (1/4 tsp) and not supplements. 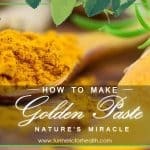 Here is the recipe – https://www.turmericforhealth.com/turmeric-recipes/how-to-make-turmeric-paste-or-golden-paste. If all goes fine increase it upto 1 -1.5 tsp per day. So much information. Love it! Thanks Jennie. Do you take turmeric? My arthritis has just flared up and started in my wrist. I have no idea why this has happened as I only had in my fingers six weeks ago. Now I have started to take fresh tumeric and ginger mixed with milk. I did read fresh tumeric (for the best effect) needs to be taken with either milk or yogurt. Can anyone give me more information on whether this is true or not. There is a swelling on one of the finger as well. When I take milk along with pepper and turmeric I feel my body heat goes up and I get burning sensation in my eyes( for few mts). 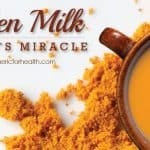 What can I do that to control the body heat while taking this turmeric, pepper milk. Can I apply the paste directly on the affected finger? Thanks a lot. Hi, try stopping pepper and take turmeric with coconut / olive oil. Check if the sensation continues. According to ayurveda that’s why it is recommended that you should take turmeric with diet that’s how the heat can be controlled. Try adding turmeric to foods and salads etc. I am sure then you will not have this issue. In terms of dosage 4-5 gms per day is something you can take for lifetime. Thanks KeshavK I will try this recipe. Do share your experience, how it went. I have only just started taking the turmeric paste so it’s early days as yet. Can anyone tell just how long it will take before I feel its effect.